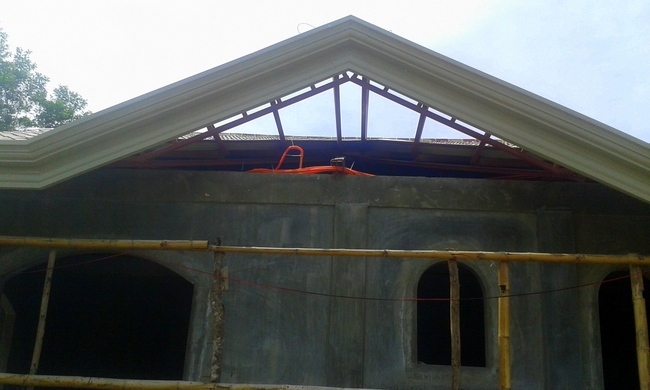 Here’s the latest progress report on our new home in the Philippines, located on the island mango province of Guimaras, in whacky Western Visayas. This is Week 16 of construction. 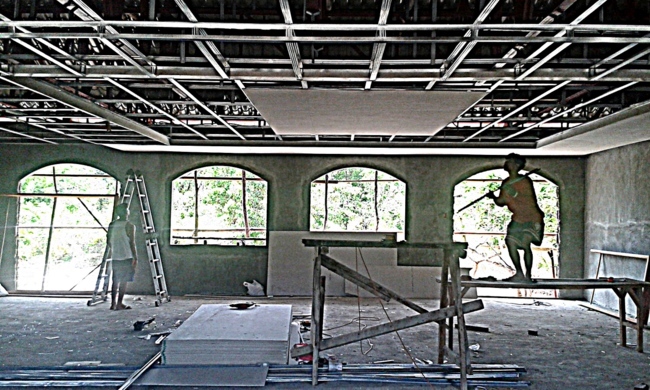 We have hired a crew from nearby Iloilo to do our ceiling installation. 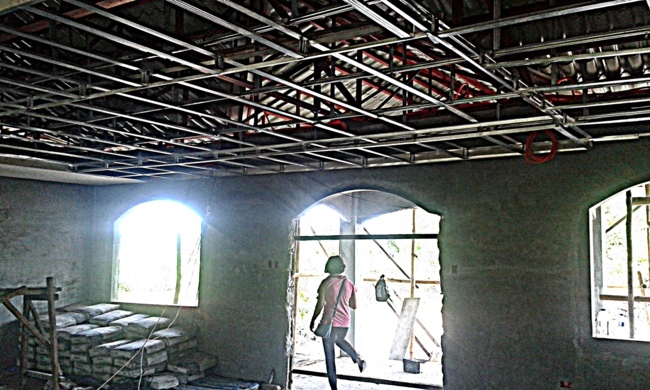 That’s my lovely asawa standing in our sala, living room, where the installers have finished the framework for the new ceiling. Here’s a look at two of the workers, part of a four-man crew. The men used laser pointers to layout the ceiling design. 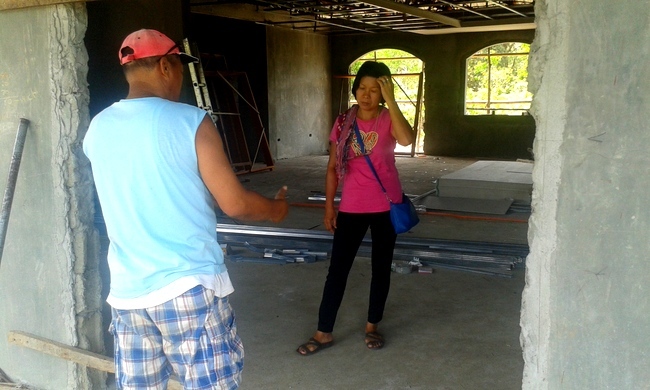 Our lead man, seen in the next picture with the orange shirt, is planning the same ceiling design he used for a residence of the Garin family, a major political clan in Iloilo. 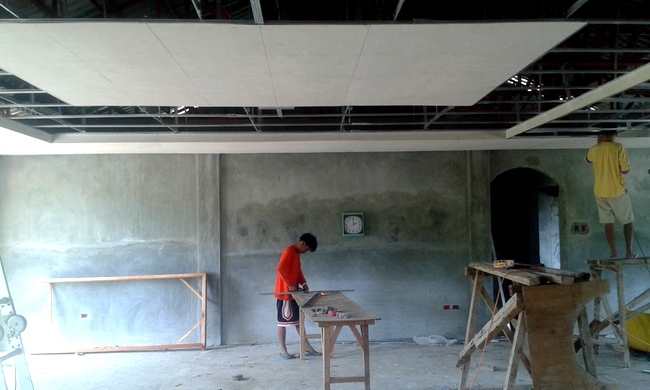 Our lead man was also the head foreman for the ceiling at the new Marriot Hotel in the MegaWorld complex in Iloilo. We actually went to our site again late yesterday afternoon to deliver three granite counter tops we purchased at A.M. Builders in Iloilo City and a good portion of the living room had already been completed. It looks like we picked the right lead man. 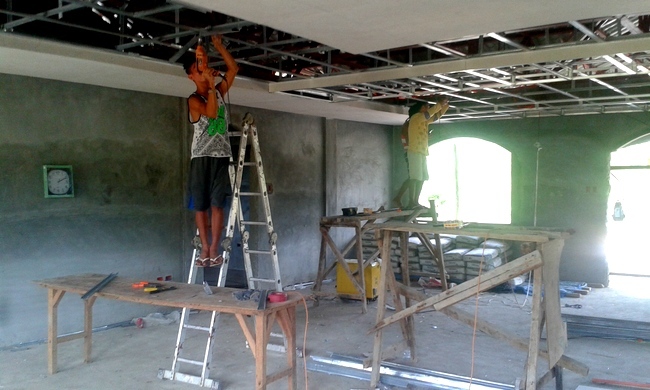 The ceiling crew is working every day of the week as they are being paid by the job and are not receiving daily wages. That, too, could explain the progress the men have made in only a week. 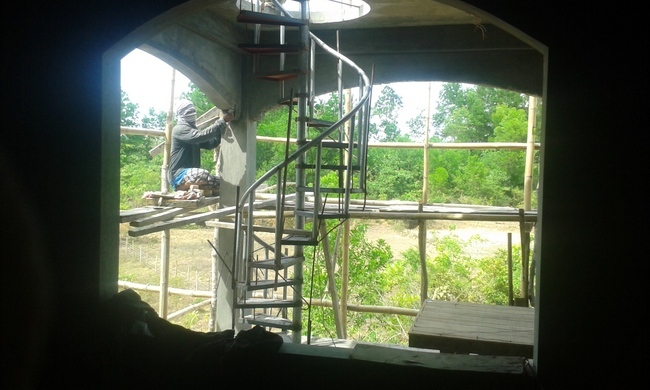 We’re also having a spiral staircase, located in our garage, which leads to the terrace above our new parking area. 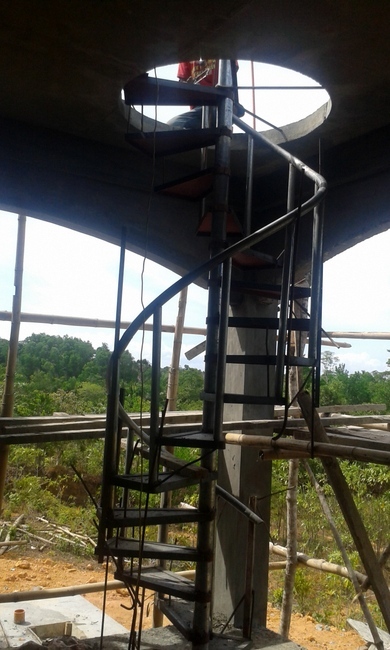 The man building our staircase has manufactured the structure from scratch and originally wanted 8,000 pesos, 180 US Dollars, to do the installation. My wife was only able to knock 500 pesos off the price and she’s a tough negotiator. Our foreman has started work on concrete precast designs which will go around all of our windows and doors. 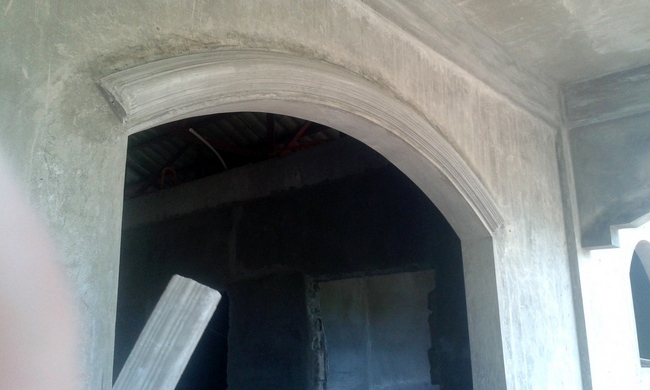 It adds a nice architectural detail to our new home in the Philippines and is something my wife wanted. Our foreman is being paid 250 pesos per meter. 5.66 US Dollars, and the total charge for this work is 55,000 pesos, 1245 USD. 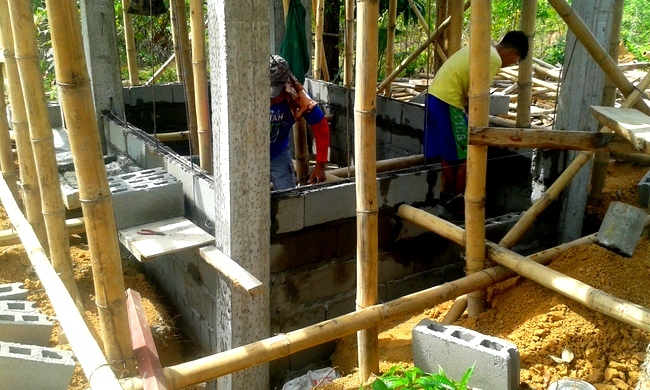 The 55,000 pesos is the total labor cost and our foreman pays his workers on this job from this amount. Our foreman has now reduced the crew that my asawa, our pay master, is responsible for, from 19 to 5. These five workers, separate from our foreman’s precast crew, will be responsible for installing the doors in our new home and other remaining projects, such as putting in our new sinks and Comfort Room toilets. Concrete trim, such as the section, shown above, will be added to all sides of the window and are cast ahead of time and then placed on the windows and doors after the concrete has dried. That’s our foreman, Boy, on the left, explaining to my wife how our front doors will work. The doors, according to Boy, will be a double “fan door,” and will swing open to the outside. Each door will have a handle and two locks, but one lock will be a “dummy” lock. We will have deadbolts installed on all of our access doors. The roofers were supposed to complete the one remaining gable, seen below, two weeks ago, but the lead man for the crew was sick. The installers will return tomorrow to finish the installation and receive their final payment for the job. If you have new doors, you need door jambs, of course. We have double doors in the front and a set of large double doors in the rear of the house. Four CR’s, Comfort Rooms, will have the classic plastic “Pretty Door,” a standard bathroom door in the Philippines. Doors are also being built for the four bedrooms, laundry room, walk-in-closet for my asawa, plus the door to my office. 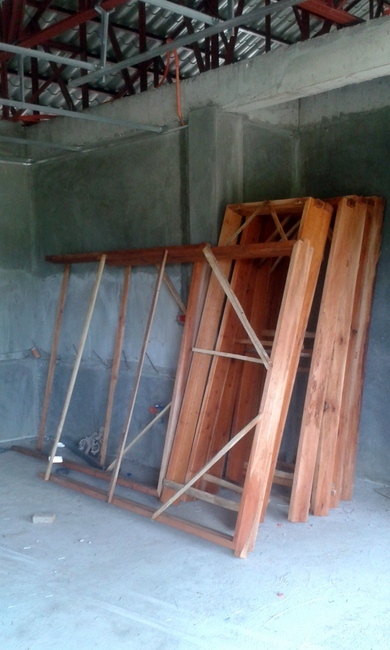 A local furniture maker in Guimaras is building our doors. We still have my brother-in-law Joery, along with his two-man crew, working on the new dirty kitchen. 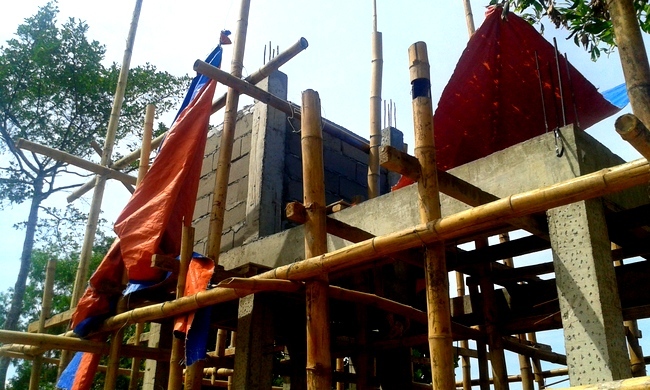 The men have started laying the hollow blocks for the new building and have constructed the chimney, seen in the following photo. We have informed Joery that he will not need to do any wiring for the dirty kitchen. We are installing solar light bulbs for the dirty kitchen. We found solar panels that will recharge two light bulbs for 3,500 pesos at a local hardware store in Iloilo. The solar panel kit also contains a solar-powered cell phone battery charger. I leave you with this final image. 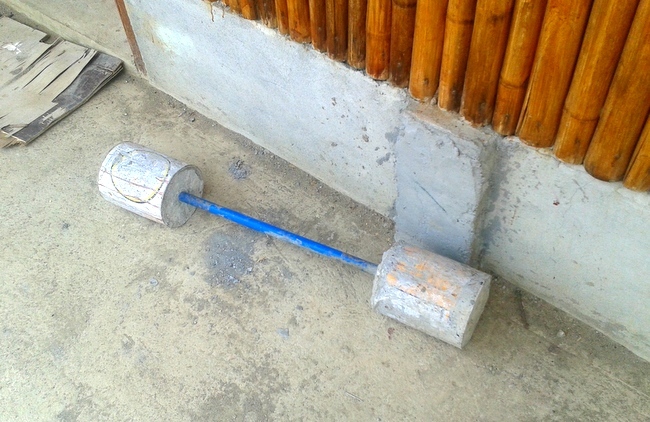 One of the ceiling installers works out on his lunchtime with this set of homemade barbells he made with empty paint cans, plastic pipe and concrete. Another example of the ever-resourceful Filipino. dave I have really enjoyed the reports on your new house,it looks great,will be a fine home.I am off to Alaska so will have to wait to see the finished product.wish we could have had you boss on our project in subic would have been easier and would had save us a bundle.again great job and thanks for the updates. Thanks, much, Wayne. We have been told by other expats on our island that our foreman is the best on the island. He and his crew have done an excellent job and my asawa and I are both very pleased with the work done. I regret never having made it over to Alaska, only got as far as Alberta province just across the Montana border at Glacier National Park. Good luck and thanks again for the kind words. Thanks, Derek. As you well know having a good construction crew is essential. 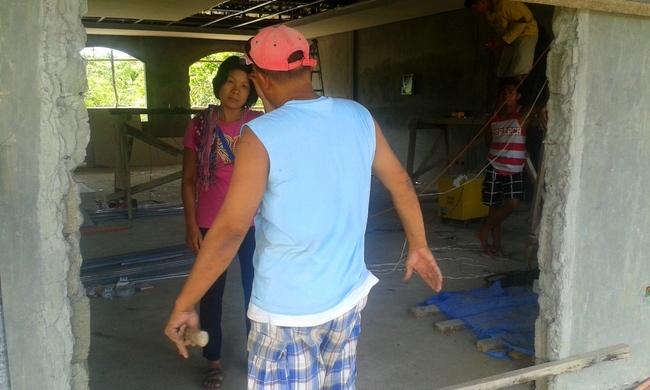 I am fortunate to have my asawa, brother-in-law Joery, and our foreman Boy taking care of everything. I’m just the money man. Hope to see you in Guimaras some time. I am sure you will need a break after the renovation. Take care and keep cool. Thanks, Roger. The spiral staircase to the terrace is my asawa’s idea. I probably won’t be using them that much but it’s a feature she wanted. I charged the battery on the solar panel yesterday and used the solar light bulb in the dirty kitchen this morning. It has two bulbs, only used one, and it works great. I plan to buy one of the solar rechargeable standing fans next time we go to the big city. House is really coming together. I know you can’t wait until it’s finished. Looking forward to getting back on the 1Oth of May. Had to stay in Florida an extra week due to Anne having Pancreatitis due to a Gallstones and bad Gallbladder. Had to have her Gallbladder removed. Spent 5 days in the hospital, but we are back in Ohio now and she is doing fine. Thanks, Papa Duck. We hope to get moved in by the end of June. Wow! Glad to hear Anne is doing OK after the operation. At least she had the operation in the States though there are some good doctors here. Melinda and I both send her best wishes and a speedy recovery. My asawa and I walked up the staircase yesterday, Pantera. Great view, good breeze and you’re right, a nice way to have a cold beer on the terrace. Dave: Thanks for the info on the solar system defiantly something I’m going to look into..
Have a great PI day……..
You’re welcome, Roger. We are going to buy more of the solar lights during our next trip to the big city. Plus, I have an expat friend that hooks up his solar panel to a motorcycle battery. That’s something I will also check out. He uses the solar panel to recharge the battery, too. Good to hear your kitchen sink faucet and backsplash have arrived. We have to buy all of our tile for the floor, kitchen and CR’s but that should be our last major purchase for the house, aside from appliances. Take care. Looking nice Dave! Anxious to see the ceiling when its finished. Were you able to find granite for the counter tops 1 1/4″ thick or thicker, most all I ever have seen there is 1/2″ thick only and it can break fairly easy that thin, but figured different areas might have different thicknesses. Just curious, why do you want the front doors to swing outside rather than inside, figured you have a good reason for wanting them that way. Well, I don’t know how thick the granite counter tops are, Bill. We are going to the site today and I will have to measure them. I have absolutely no idea why our contractor wants the front doors to swing outside. The foreman calls them “fan doors” and the guy at AM builders, where we’ve purchased a good deal of materials, calls them “butterfly doors.” I will have to check with my asawa because my original thought was that the large double doors would be sliding doors. Bill, I’ve made two trips to our site since your question about the counter tops. It’s hell getting old. I keep forgetting to measure the granite but hopefully I will remember next time. Plus, I hope to have more info on the doors. Dave I live rite next door to the Garins…I will go and ring there door bell and see if they will let me check out the ceiling….first I have to get by the gate guard,,,,,,and then maybe a political donation may be in order….No I am joking with you…we are good friends with Lex son-in law)and Jenifer (daughter)plus the old man Oscar…we call him the boss. It is still hard to get inside unless you have a personal invitation. My wife say I also like you that I can be ugly….well what can I say we are both from the Chicago area. A year from now you will look back on this and wondered why you got so upset…this is the Philippines and Sh*t Happens. Fred & Ofelia in Guimbal. Well, I don’t know which Garin’s house our lead man worked on, Fred and Ofelia, but the ceiling crew our doing a great job. I’ve never met any of the Garin family but no they have a lot of clout. Ahhhh, yes, the Chicago area. A guy has to get “ugly” sometimes to motivate people and we sure got a lot of experience back in Illinois, huh? Yep, I will be at the festival on the opening day, May 11th, at San Miguel, Jordan, and hope to make quite a few visits there. Hope to see you both there and please give me a holler if you happen to spot me.Take care. Good idea, Gary, thanks. We do have such a set up at our gate here at “The Farm” and is an excellent security idea for the new house.